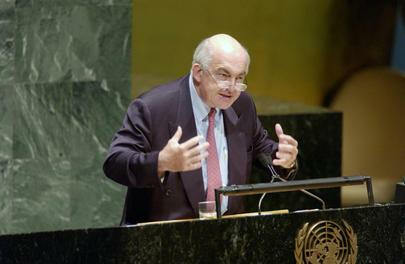 UNITED NATIONS, June 18 -- "I am not going to answer any of your questions," said Kemal Dervis after delivering a speech Monday in which he referred repeatedly to the alleged transparency of the agency he heads, the UN Development Program. Referring to the scandals in which UNDP is embroiled, particularly in North Korea, Mr. Dervis urged the members of UNDP's Executive Board to "remain concentrated on verified and transparent material facts." But when asked immediately following his speech if UNDP would, as promised month ago, now be making its internal audits available to Member States, Mr. Dervis refused any answer. It was pointed out to him that, as technically the third-highest UN official, he should at least purport to answer press questions, as do his peers, from Secretary-General Ban Ki-moon to Under Secretaries-General such as Lynn Pascoe and Jean-Marie Guehenno, and also UNICEF's Ann Veneman and even UNFPA's Thoraya Obaid. Mr. Dervis, who in his 20 months atop UNDP has held only two press conferences in UN Headquarters, then said, "I am not going to answer any of your questions." Inner City Press then asked, as had already been asked in writing to UNDP Communications staff and the individual involved, if UNDP's head of budgets, whom Inner City Press named in the question but will not name in this report, was demoted last week. Mr. Dervis, hiding behind the spokeswoman to whom Inner City Press had pre-asked the internal audits question, looked away, then rushed up the UN's escalator and was gone. Kemal Dervis: transparency, but not for me -- "I will not answer any of your questions"
UNDP's still-shifting position on making its audits available even to the Member States which provide UNDP's funding was covered last week, in connection with UNDP Associate Administrator Ad Melkert's speech. Since then, UNDP sources tell Inner City Press that UNDP's head of budgets had found and was reporting inside the agency irregularities in UNDP's use of Euros in North Korea -- the "hard currency" issue which is one of the subjects of the preliminary Board of Auditors report issued June 1. And then, these sources say, the axe was dropped, in the first instance by UNDP's head of the Department of Management, Akiko Yuge, but above her, the sources say, by those at the top of UNDP. UNDP sources say that the head of budgets was told if she speaks with the press or others outside UNDP, she will be terminated in full. She was provided, in writing and by phone, with an opportunity to comment on this story, but did not. She has nearly reached her pension, having previously represented UNDP in Mali and elsewhere in Africa. Where, many continue to ask, are the supposed whistleblower protections? The head of budgets question was posed, explicitly for mid-day deadline, to UNDP Communications staff -- who, Dervis-like and apparently receiving instructions or "leadership" from Dervis, also refuse to answer questions, for example on the specifics of acknowledged corruption within UNDP in Myanmar, about the complaints of UNDP local staff in Georgia and elsewhere. There are legitimate policy debates about how the UN system should engage with different kinds of governments (to put it diplomatically). But running from the press and refusing to hold press conferences is hardly the way to forward the debate, and hardly gives any reason for confidence in UNDP's desired central role in UN service delivery in countries all over the world. That agenda... is being ill-served. Speechifying by UNDP about transparency is scheduled to continue in UN Conference Room on Monday afternoon. Developing.